It was only a few short months ago that I had zero interest in Minecraft, but after reviewing 21135 The Crafting Box 2.0 and 21136 The Ocean Monument all that changed. I am now doomed to obtain sets from yet another theme. When the first wave of 2018 products were revealed it was refreshing to see some bargain basement offerings and I have the cheapest four in my grubby paws to give them the once over. We'll start with the smallest and work our way up. First we'll look at 21138 The Melon Farm. At £12.99 you wouldn't think it possible to go too far wrong so let's find out what we get for our pocket money. 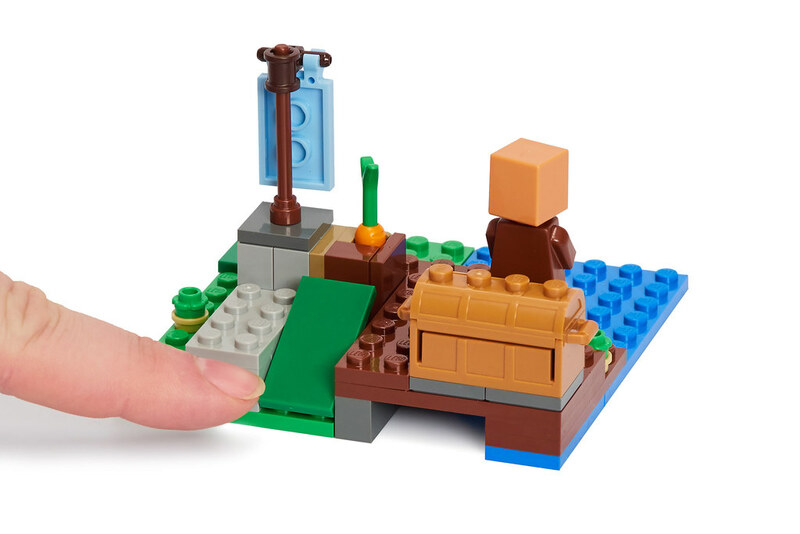 It's an attractive little box – just a bit bigger than an adult hand, and contains a mere 69 pieces inclusive of 3 minifigs. I say minifigs loosely as I've never quite decided in my own mind if a Creeper is a minifig or not, but the database says so and that's the Gospel I guess. Spin the box around to see the play narrative and functions. Looks good – would certainly appeal to me as a child. Here's the box contents in full. 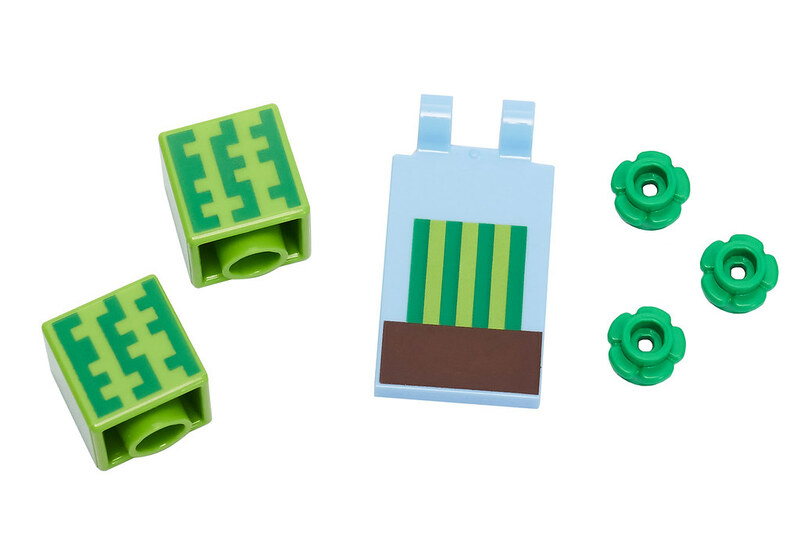 There's an extra 4 spare parts included – a melon quarter tile, a carrot top, one of the new flower edge petal plates and a stud. There's a few new parts too. We've got printed melon blocks, a printed tile with Melon In Ground pattern and Bright Green Plate Flower Edge (5 Petals). Let's not get overly excited though – a parts pack this is not ­– but the melons are great and add another useful element for play. 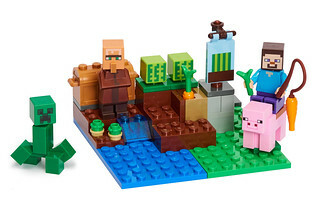 Minifig wise, it's Steve again (yawn) and a creeper – however, the star of the show is the Reddish Brown Villager. Previously this figure was only available in 21128 The Village which was a big ticket item. To find him in a set at this price level immediately after The Village's retirement is very welcome indeed. Also there is a brick built pig – this is just downright cute and is another handy addition to anyone's Minecraft world. 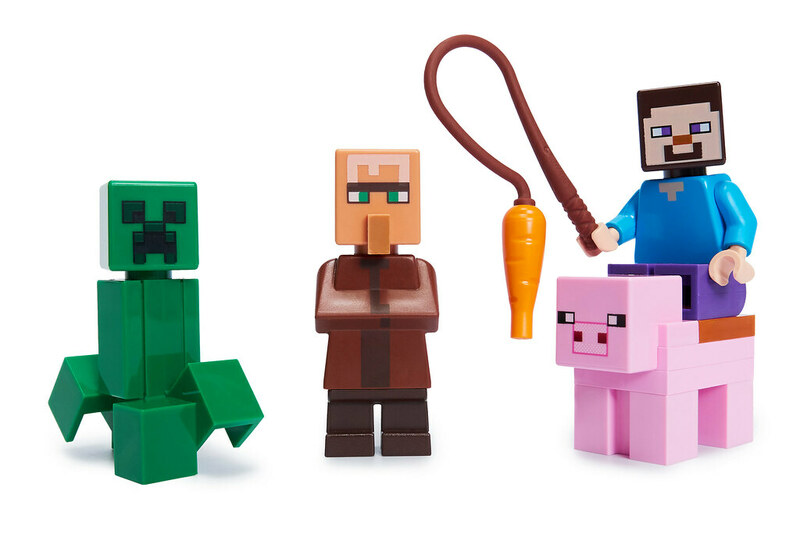 Steve can ride the pig using his carrot on a stick – an amusing touch. It took me less than 10 minutes to put all the bricks together and here's the result. It's a decent enough vignette in a typical Minecraft terrain style, nice and colourful, which wouldn't look out of place in any layout. In fact one or two of these would make a great addition to my 21135 Crafting Box 2.0. Moving on to the hidden play function, spin it around and you'll find a see-saw arrangement on which the melons are placed. This is used to mine the melons. It can be done gently to prise them out of the ground, or as I have done, as usual, to explode them up into the air – mind your head Steve! It works perfectly. Equally it's a good platform to explode Creepers too. There's a little box, or planter, built with a 1x2 panel which acts as a carrot holder. Steve can therefore remove the carrot with ease. At the back there is a chest to store melon quarters and carrots in. For a small set, they've done well to get a lot of interesting features in. Got to feel sorry for the Villager though. He can't pick anything up with his arms permanently crossed like that and looks kinda grumpy about it. I think LEGO have done an excellent job here. 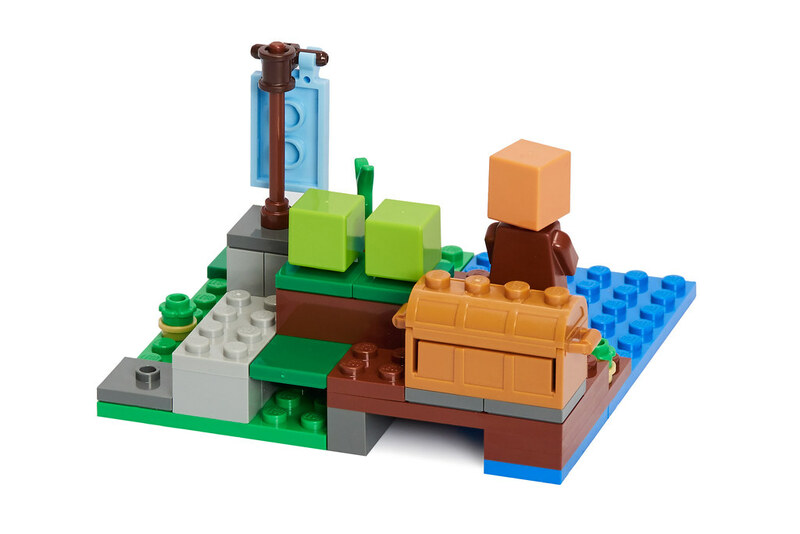 It's a bargain price, you have the previously exclusive Villager, and a pig, and new melon parts, plus it will easily integrate into an existing layout. These all appeal to the existing Minecraft collector. As well as that, it's a definite hook. 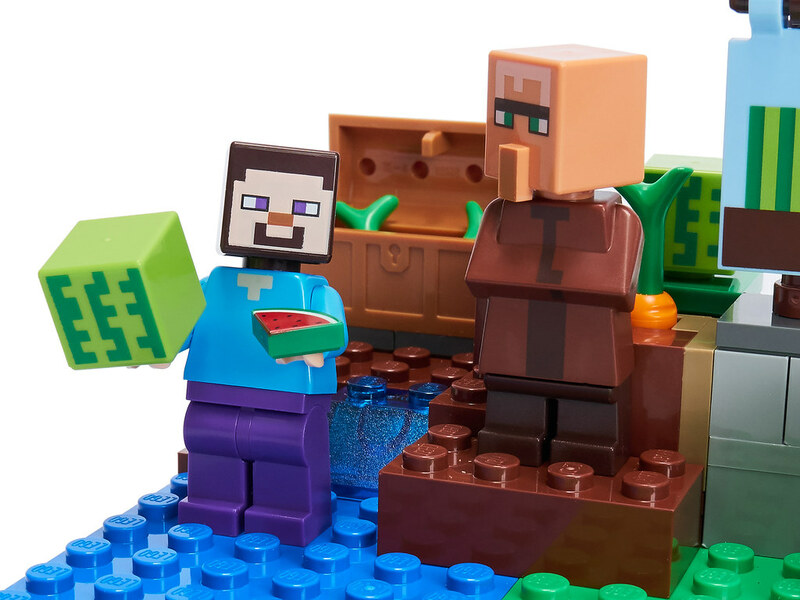 At an RRP of £12.99, it's going to appeal to those who haven't bought into Minecraft before. US and EU prices look ok too. 69 pieces might not sound much, but once completed with the minifigures it feels like it has substance. Lord knows I've spent more on a polybag with less pieces, and never even opened it. When it inevitably goes on sale at Amazon or similar for £10 or less I'd almost call it an army builder. Villagers, Creepers, pigs and melons plus the additional bricks means you simply can't go wrong. For many kids this may be the first time that they get Steve as a minifig, so I can overlook him being present again here. The set has some playablilty and will no doubt serve as the purchase that drains parents wallets as they look to buy bigger and better over time. As a first foray into Minecraft 2018, I'd say this is a good start. What do you think? Please let us know by liking this article and sharing your thoughts on the set in the comments below. The pictures are very nice. 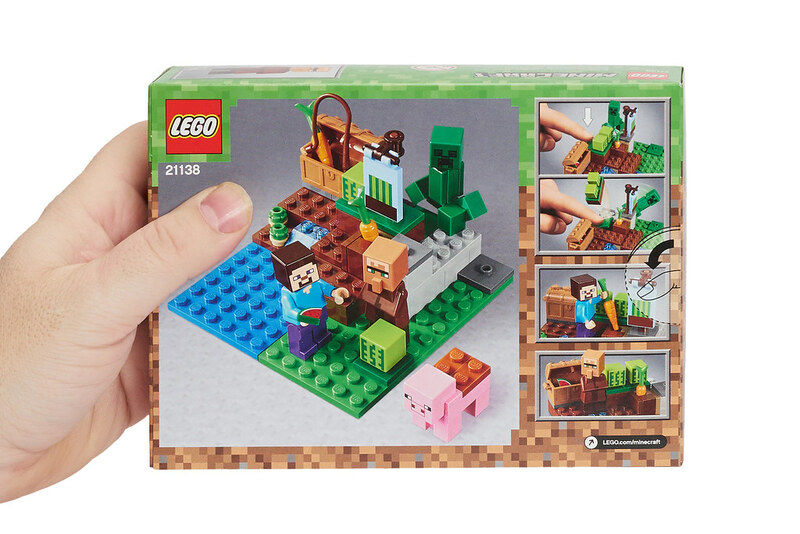 I love the Minecraft farm sets, the melons, melon flag and pig are great, but not $15 for 69 pieces great. More so for $5 more you can get the amazing chicken set with 150 more pieces. Yeah, I think the chicken set might actually be something I get. I've only gotten one minecraft set before, the jungle tree house, and I didn't like it at all. This new wave appears to be much better, possibly the best they've done for the theme? 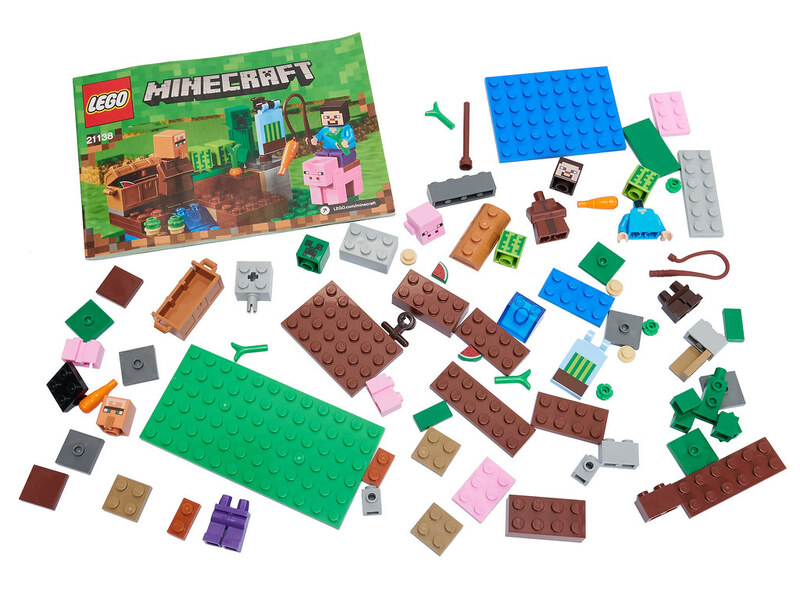 Basically it's a Minecraft battle pack. Not such a bad thing. I think the pig is rather cute. Your pictures are amazing. I aspire to such pictures. These battlepacks would be MUCH better if they not included cheap as dirt Steve/Alex. This one should have another vilager while nether one - another Pigman. Did you do the photography for this? These photos are incredible! Which came first - real square melons or Minecraft square melons? Like everyone else, I appreciate your photos! The white background is very clean and the set pops right off the screen. @BrickByBrick: Whaatt?? You didn't like the Treehouse?? What's not to like? 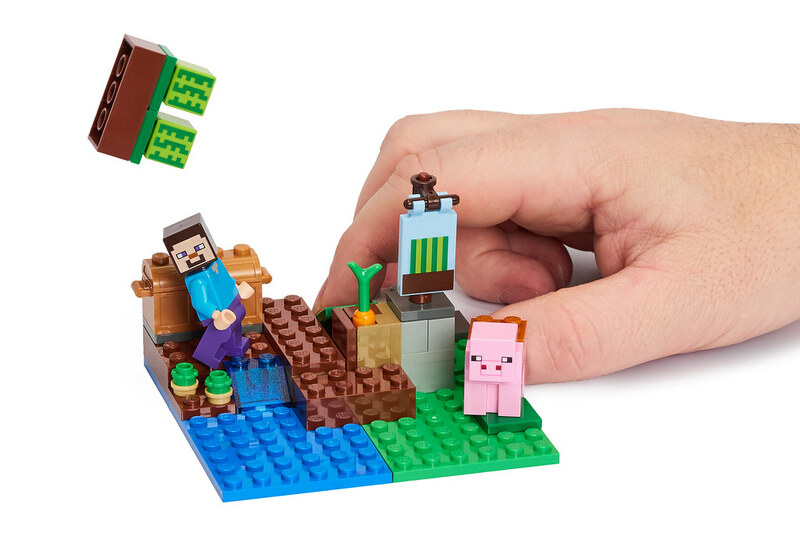 Lego has done a good job with most of its minecraft sets since they appeal to the classic blocky lego style, I wish they would include more skins besides alex and steve. There are plenty of official skins from the minecraft marketplace and other partners which would be much cooler. @CM4sci ha ha "top NOTCH" (creator of Minecraft). Great review. Tempted to buy the set. I wonder: does a regular minifighead fit on the villager body? I already wanted this set but now it's a must have ASAP. I wasn't aware it was possible to pack so many features into a farm! And yeah, the PPP is poor but there are so many rare/exclusive parts and prints that it's worth it. The model also seems more attractive to those who aren't familiar with the Minecraft style. Iso's review text is always a special pleasure to read, but the lighting setup & amount of time spent post-processing the photos for this small set deserves utmost respect. Top work. As many others have said the general photography is fantastic, but more specifically I'd say iso is the master of the 'dynamic shot' - if it moves it will be captured in motion perfectly! 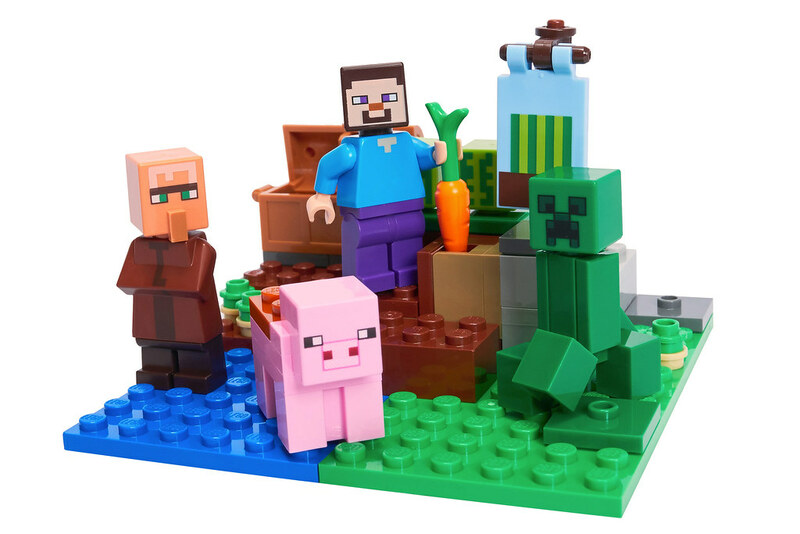 I couldn't really see myself buying this set because I have very little to no interest in Minecraft but the review was engaging enough to keep me hooked. At least I know where to go if I want square melons. Real square melons came first. I think that tradition started decades ago in Japan, long before the game. I've yet to buy any Minecraft sets but these small "battle pack" sets look great. A good option for those who want some of the figures from the theme but don't want to commit to buying the bigger sets. It's not that good of a set, but at least it is a cheap way to get a Villager and melons. @Hobbythom: it will. I haven't tried it myself, but i have seen it done on Flickr. Hammerstein NWC, for example. Great addition to the Village! 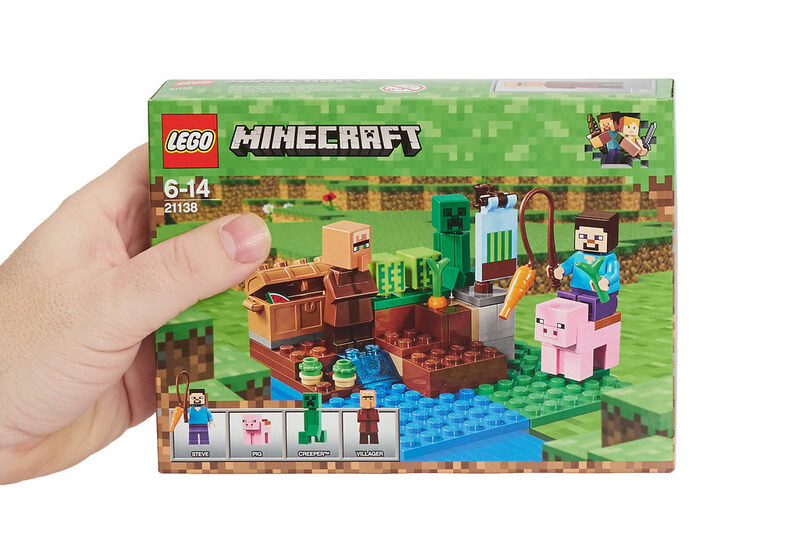 I just don't get the appeal of these Minecraft sets.